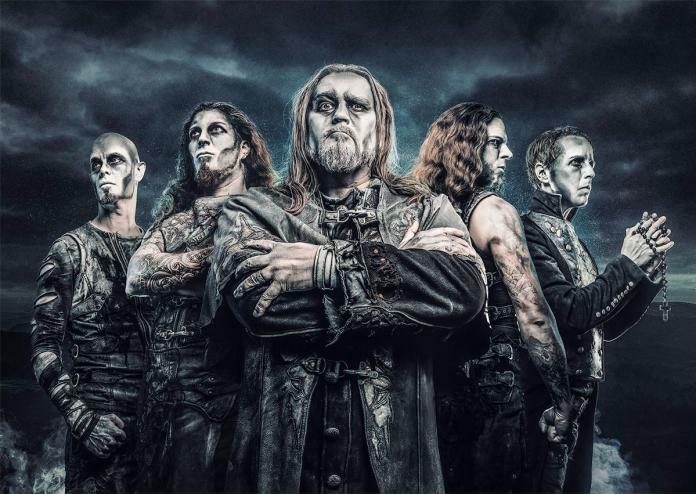 Powerwolf have been one of the most consistent and, at the same time, most scorned bands of the power metal world. They have been called predictable, shallow, you name it, but compared to other of their colleagues they have managed to carve their own niche and sitting comfortably in it. The Sacrament of Sin is their seventh album to date and one that almost seamlessly continues their history so far. Firmly planted within their set of highly theatrical power metal, the German quintet has managed to become instantly recognizable, not least due to the voice of Karsten Brill (aka Attila Horn) and the almost ecclesiastic atmosphere, which also goes hand in hand with the band’s lyrics that have been skirting between holy and blasphemous, but often with a dash of humour without drifting off into tomfoolery. Now one of the above-mentioned points of criticism is a lack of progression, which, in all honesty, does hold some water, but given the fact that Powerwolf DO have their own sound, it is not necessarily a major detractor. So where does The Sacrament of Sin stand? Overall it might be the most varied album of the Germans so far, working off a solid power metal foundation, but drawing from the already mentioned church-like atmosphere and its grand organ, some classical influences, a symphonic and cinematic atmosphere and orchestration, some flirting with more rock-oriented sections, even a folky touch, but always remaining under the Powerwolf umbrella. 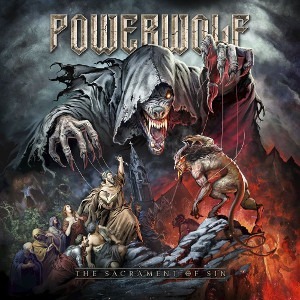 The three singles that Napalm had released prior to The Sacrament of Sin hitting all had already indicated that any “hopes” for a more or less dramatic change in direction for Powerwolf were unwarranted, because if it says Powerwolf, you get Powerwolf, not more, not less. Opener “Fire & Forgive” is as typical as they come, uptempo, catchy, with a church-like Latin-sung choir for a bridge and energetic chorus, showing that everything is well in the Northern Germans’ camp. “Demons Are a Girl’s Best Friend” ramps up the catchiness to 12 and “Incense and Iron” is one of the flirts with lighter waters and the mentioned folky touch, which also works well and actually reminds a bit of Sabaton in certain places. So clearly no experiments, but as wide of a spread as the Germans have been offering. Speaking of Sabaton, there are a few moments, where the Swedish tank squadron comes to mind, but more because of a similar trajectory, not because they are trying to cross over into their territory. The title track and closing “Fist by Fist (Sacralize of Strike)” bolster the double-bass driven power metal section, while “Where the Wild Wolves Have Gone” is an exceptional ballad that really highlights Dorn’s great vocals that once more manage to elevate the song to the next level through their expressiveness and emotional power. And overall Dorn’s impressive range and strength still is one of Powerwolf’s strongest weapons all around. Surely The Sacrament of Sin is not groundbreaking, but neither is it just a lame rehash of previous albums with Powerwolf walking the thin ledge between and once more managing to stay on it. Haters will definitely continue to hate, but not only will it satisfy pretty much any Powerwolf fan, it also should serve as an excellent starting point for the yet uninitiated. Together with the once more outstanding cover artwork, Zsofia Dankova be hailed, Powerwolf are continuing to forge ahead and give their mana to the masses! This entry was posted in Featured Review, Power Metal, Reviews and tagged 2018, 9, featured, germany, napalm, power metal, powerwolf, Saarbrucken, Saarland, sabaton.